The title of this post is the same as that of this article in the Independent. I rarely buy a plastic bag and it is usually, when I travel around and have forgotten to put a bag in my coat pocket. I suspect I haven’t actually bought one since June. I’ve also thought it wrong since the charge was introduced, that some shops didn’t charge, so this will create a level playing field. As to the rise of the charge to ten pence, the biggest effect could be, that people remember to take a bag more often. I do suspect though that smaller shops will complain and will say they will have to close. But if they don’t have to charge, the taxpayer is effectively providing them with a subsidy. If we are widening the plastic bag charge, surely now is the time to do something similar for fast food packaging. The latter is personal, as quite a bit seems to end up outside my house in the front patio. How about a ten pence packaging/obesity/littering charge on all fast food meals? This may seem a bit strange for the Tories’ flagship Council, but it does seem well researched, according to a report in today’s Sunday Times. Any house worth over £10 million would be put in a new band above Council Tax Band H and the owners would pay double the Band H rate of tax, which is currently £1,376 a year. Westminster has 2,000 properties in this band, that are worth over £10 million and the scheme would raise £2.75 million, if everybody paid the extra, which would be voluntary. It’s an interesting concept, that has been well-thought out. But like most radical plans, I doubt it will see the light of day! This is the headline on an article in the Sunday Times, which suggests that the UK may cut corporate tax rates from 20% to 10% unless the EU grants the UK access to the single market. I don’t know whether it is speculation on the paper’s part, but it does illustrate how Brexit means that it removes a whole set of rules from the UK Government. It is an interesting suggestion! I think it could have these effects. Companies like Apple, Starbucks, Google and Amazon would look at the UK favourably. If a company was spending fortunes on research, the UK would probably be more attractive, as if say they developed a world-beating drug, they wouldn’t pay as much tax on the large profits. But I never heard it mentioned in the Referendum. It probably shows how our politicians all think inside boxes and that those in Europe do even more so! Will Manchester Get A Crossrail-Style Levy? My Google Alert for Crossrail found this story in Planning Resource, which is entitled Crossrail levy model proposed for Greater Manchester mayoral CIL. This first paragraph sums it up. A proposed city-regional mayoral Community Infrastructure Levy (CIL) for Greater Manchester would operate in the same way as the existing pan-London charge to raise funds for the Crossrail project, with councils able to implement their own levies alongside the mayor’s charge, it has emerged. Will Manchester’s council leaders and voters go for it? From here in London, where if the Mayor wants to fund something sensible like Crossrail 2, all the Mayoral candidates and the Boroughs seem to back it, I can’t see all ten Manchester boroughs agreeing, as they seem to have a long record of doing things their own way! Transport for London and their various predecessors have always been very particular about handrails on stairs in stations and also on buses. Here’s some examples. But are we that particular in our homes. I put this handrail on my stairs. And I put extra hand holds in my bathroom. 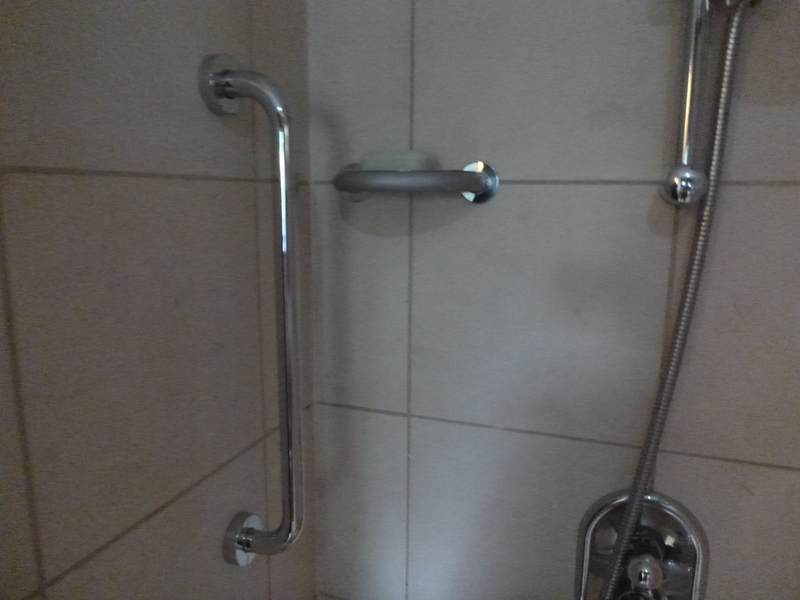 I feel very strongly that when you fit rails and hand holds for safety reasons, that you should not have to pay VAT on the hardware and the work. Especially, if as in the case of the handrail on the stairs bloody Jerry should have put them in when he built the house. My MP agrees and she has written to the Financial Secretary to the Treasury. 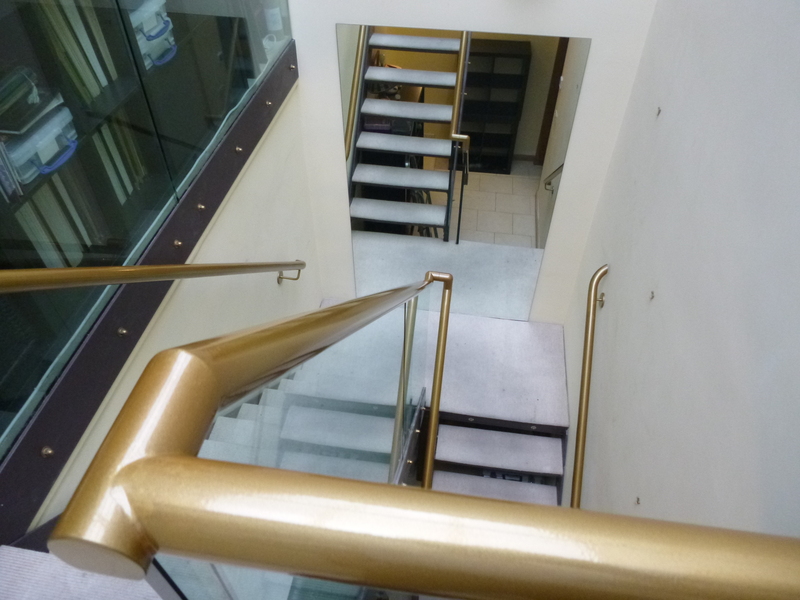 I suspect in the case of my professionally-designed and Sheffield-built handrail, the biggest objections to removing VAT will come from those snake oil-salesmen, who get the elderly and disabled to buy unnecessary stair-lifts. An interesting point, is that probably quite a few premises that have to fit extra handrails and handhold are commercial premises, like offices, restaurants and shops, who of course would be registered for VAT.